Just a nice quick Happy Birthday card to go with the yellow flowers I bought. Butterflies, a Happy Birthday sentiment using the free version of Rosewood STD Regular Font and a lovely bow. I think the beautiful deep colour and generous size of the bow adds a real richness to the card. I think maybe, I should have sponged and edged the card... maybe next time. The gold flower is punched from gold card with a gem centre and some gold cord to finish it off. Apologies for the poor focus on the photo... must have been off dancing with the butterflies! This sweet little notebook set is made with a cover of pink glimmer card and a strip of purple punched card along the bottom of the cover (Martha Stewart Doily Punch). I added a chipboard flower on the front of the notebook, then a sheet of white card in the packet as a backing. The white card was cuttlebugged with Swiss Dots. I added a small pen sitting on top of the notebook. The topper is made with a Nellie Snellen oval die (love Nellie Snellen dies) and the sentiment stamp is from Stampin Up. I've found that most people like birthday cards which actually say "Happy Birthday" or similar, as opposed to no sentiment. So I sometimes find it difficult to come up with new variations on the theme with just the same few birthday sentiment stamps I own. I'm hoping the new Birthday Sundaes Challenge Blog (starts March 20th) will give me some new ideas and also "stretch" me a bit with trying new techniques. Apparently, more birthday cards are sold in stores than any other type of cards. 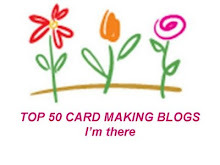 And I'm finding when friends ask me to make cards, birthday cards are among the most popular, so the Birthday Sundaes Challenge Blog seems like a great idea. Birthday Sundaes is a weekly challenge blog beginning March 20, 2011. The goal of Birthday Sundaes is to build up those birthday card stashes! I just love to make birthday cards and hope you do too! Types of challenges Birthday Sundaes will be hosting are color, supply, recipe, inspiration & technique challenges incorporated into birthday themed cards. If birthday cards are up your alley, I noticed they're having a DT call as well. This card is made with a digital image from the amazingly talented and generous Sharon at Steady On. Love the buttons with all the different patterns. I added a sentiment from the equally talented and generous Paulette at Create With TLC to the digital image and printed it onto cream paper. A few real buttons and a faux stitched border matted onto black card finish it off. I think it will be a good card to give a friend who likes sewing. I'd love to try real stitching on cards as it looks so effective on cards I've seen... an adventure for another day, perhaps. The English Rose Paper is from Kaisercraft. The shaped tags on some of the cards are Journal Tags from the same range. I was able to indulge my love of vintage and pearls with these papers - quite the shabby chic look, I think. On the last card, I added real lace (as opposed to paper lace), something I haven't tried before. Love the little butterfly perching on the tag in the third card. Thanks Amy for the butterfly punch. I'll be using it a lot. Have you heard of the horrendous floods which recently deluged Australia? In the state of Queensland, 75% of the state was affected. This is equivalent to twice the size of Texas or France and Germany put together. Victoria and New South Wales were also hit by flooding. Loss of life, property and livelihoods was devastating. Help, donations and messages of support from fellow Aussies and from people all over the world has been amazing. Now one Aussie card maker has come up with a unique idea to help those affected say "Thank You" to the generous souls who have rallied to assist. Simple. Make Thank You cards and send it to her for distribution. What a grand idea... the Power of One. "HEART CARDS" is a project to give communities that have been affected by devastating events, such as natural disasters; and community groups, a way to say "Thank You" to those who have helped them out in times of need. Paper-crafters are asked to make packs of 10 thank you cards or blank cards that will be given to communities and groups. "HEART CARDS" will be an ongoing project to create hand made cards for those families who have lost so much. Please keep checking back here on our blog to keep up-to-date with our latest card drives. Thank you for your interest and for taking part in this VERY worthwhile cause. Even if you can't help, I thought you might like to know about this project which reflects the supportive and caring nature of our wonderful papercrafting community. For more, head to the Heart Cards site. Since my original post above, a severe cyclone (hurricane) has hit Queensland - lots more hearthbreak. In some cases, whole towns have been virtually wiped out with houses reduced to matchsticks. Plus more terrible floods and bushfires have hit Victoria and now bushfires and homes lost in Western Australia. Just 2 cards where I've been trying out new techniques. Apologies for washed out photos, (also discovered it doesn't help to photograph them on a black background). The first one I've been playing around with distress inks and background stamping... actually looks quite nice and so much cleaner and brighter in "real life".The Japnese Girl is a Sparkle n Sprinkle stamp and the background stamps are from Kaisercraft. I love the House Mouse Amanada Writes stamp, so matched it with a Happy Birthday sentiment stamp and layered partial cuts with the Martha Stewart doily punch. In the absence of great photography skills, I'm wondering if I need a light box to take more consistent photos, so as not to be at the mercy of the weather and variable light. I went to the camera shop to ask about it. He said forget photos. Scan instead. Any thoughts on lightboxes, photo tips or whether it's best to scan? What works best for you? Looking For Nestie Friendly Stamps? 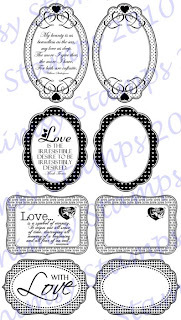 I've just updated my October 2010 listing for Nestie Friendly stamps. I've also included some Nestie Friendly Digital Stamps I came across. Go to the orignal post to check it out. Do you know of any others to add to the list? I love the concept of Nestie Friendly stamps, so will be continuing to update the list as I come across more. Friendship is what binds the world together in peace. For Christmas I received a wonderful card from my sister - not handmade, but amazing all the same. It was a card saying a donation had been made in my name to help a woman start a small business in Sri Lanka in the wake of the Tsunami and Civil War. 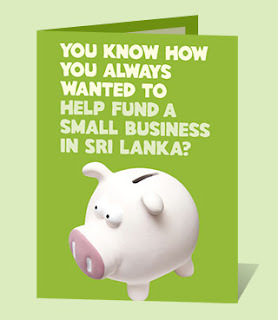 This is through an Oxfam initiative offering other great gift card ideas for sponsoring a bicycle ambulance, clean running water, chickens etc. Best of all, these cards can be given all year round. Great to see imagination, creativity and reaching out all come together. And I love the idea of a card. Like our handmade cards, there's a sense of connection and something special in a card picked out especially for you. Wishing you all everything wonderful for 2011. This is a Christmas card I made for a friend who likes the distressed look. The background is a blend of Tim Holtz Shabby Shutters distress inks onto white card, and a touch of Tea Dye distress ink overlaid in parts. I usually use a blending tool, but sponged the background this time, and quite like the effect. I still started from the edges as Tim shows, and find that works well. I also sponged the edges of the flower with distress ink to make it stand out from the background. 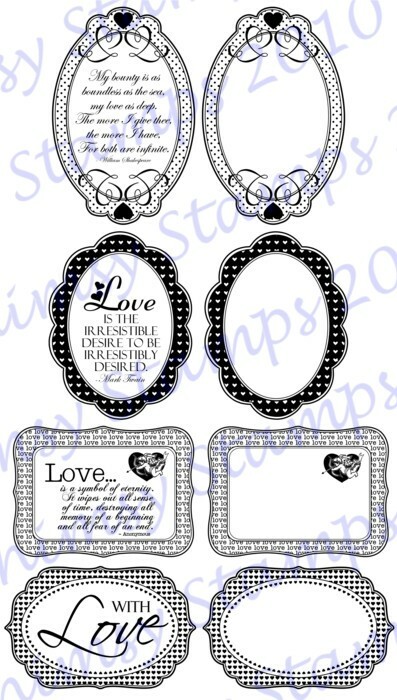 The background stamps are from Kaisercraft and the sentiment is a Verve stamp and I think they fit the Tim Holtz style as well. The flower is basically 9 punched circles fancy folded then arranged in a circle. I used a 1.5 inch scallop punch. The holly is cut from Designer paper with Glossy Accents on the 3 holly berries. I saw the folds for the flowers in a book called Fabulous Folds For Card Making by Tanya Fox. Lisa Silver was the designer for the card that inspired mine. You can see her Happy Day card using this flower at her blog. I think hers is very effective with the 2 contrasting colours and the brad, so this flower fold is very versatile for all card styles.